This is a great family campsite situated just 8 km from Cork city. Leaving you close to the city but still has that secluded country feel. It is a four star friendly, family run park with a well laid out campsite that has separate areas for camping and camper-vans. This campsite has a huge range of facilities including a kitchen, WIFI, TV room, disabled facilities and much more. Situated just 3km from the village of Blarney the view from the site is of the famous Blarney Castle and the beautiful surrounding countryside. You will find plenty of things to do in and around Blarney. Starting of course with a trip to the Blarney Stone and then the Blarney Woollen Mills. You can also go on one of many day trips to different places such as Killarney and the lakes, Kenmare and the ring of Kerry, Clonakilty, Skibbereen and Baltimore. For more info have a look on their website or on Discover Ireland. Set in Rathdrum, Co. Wicklow next to both the Wicklow mountains and Clara Vale National Park. This campsite caters for couples and families with children and have a strict noise curfew. So it is ideal for families or anybody looking for a quiet relaxing campsite come night time. There is so much to do here, where to start?! You can hire kayaks or boats on Hidden Valley’s own private lake, they have bumper boats, bungee trampolines, laser tag and cinema nights. Some activities are an extra charge but there is a huge outdoor playground with a football pitch. With lots of games and activities organised by the staff hours of entertainment are provided for the kids. 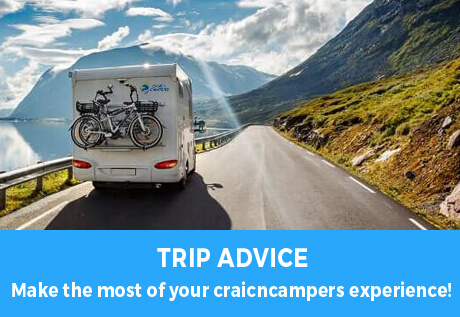 As if that wasn’t enough if you wish to leave the campsite to explore you are close to Glendalough, Avondale House, Clara Lara fun park Brittas Bay beach and loads more! For more information check out the link below. Set in the stunning grounds of Westport House Estate in Co. Mayo and within a 15 minute walking distance of Westport itself. This is another campsite with plenty to see and do onsite. Activities include a tour around Westport house, the beautiful historic home that dates back to the 1500’s. Then there is the pirate adventure park and the Adventure Activity Centre where you can go zorbing, go on a zipwire ride or play laser combat games! If you fancy trying something a bit more adventurous you won’t be disappointed! Westport being situated on Clew Bay provides the ideal location to enjoy a wide range of watersports from surfing to sailing to windsurfing and stand up paddle boarding. Take a day trip and climb Croagh Patrick or bring your bike and cycle to Achill on the Great Western Greenway. Westport is renowned for its arts and culture and there is always a festival or event taking place. So make sure to check before you travel what’s happening! Or simply soak up the atmosphere listening to live music or in one of the art galleries. Find out more below. Situated on the Wild Atlantic way just 3 km from the Ring of Kerry. This campsite boasts excellent facilities and has a high standard of cleanliness. This site may not be as activity based as some other campsites featured here but it is the perfect location to explore the island and Skellig ring. Many visit here as a detour off the ring of Kerry and it’s well worth a visit if you’re down that part of the country. It is a beautiful hidden gem that has plenty to see and do. You can take in the spectacular views from Geokaun Mountain and Cliffs that’s suitable for kids. Another suggestion is the Bray Loop Head walk , moderate fitness required but the views are well worth the effort! The Valentia Island Lighthouse at Cromwell Point is one of the Great Lighthouses of Ireland and is a must see on your visit. Nore Valley is again another family orientated campsite and has strict rules that allow no noise or socialising after midnight. All animal loving kids and adults will adore this campsite. Set on an open farm that allows free access to the farm and patrons are encouraged to help assist in feeding the animals. Home baked goods are available such as scones, bread, biscuits, pizza and take away continental breakfast is also on offer. There are plenty of activities to do in the facility including an indoor 3D maze, crazy golf and pedal go-karts. Outside within in a 10km radius you can go horse riding, swimming, fishing or visit historical sites. Also the seaside resort of Rosslare is only an hour and a halfs drive away. For more info check out the links below. Situated in Connemara Co. Galway off the coast of the Atlantic sea is this eco-friendly campsite that is friendly, efficient and in the most amazing location! You can holiday here happy in the knowledge that you are supporting the environment as this is an ecological, low impact camping environment. A private beach right on your doorstep is reason enough to stay here not to mention all the other attractions nearby! There are no activities provided here such as pool tables, televisions or video games. This campsite promotes a real camping experience and encourage campers to get back to nature. That being said kids and adults alike will love it. It’s an opportunity to really switch off enjoy being outdoors, swimming, fishing exploring Omey Island and the Aughrus Peninsula. Geosite an area that stretches from the campsite to Omey strand provides an opportunity for visitors to get a glimpse of what happens in the Earth’s crust, perfect for aspiring adventurers and geologists young and old to explore! Clifden is on the Wild Atlantic Way and you can tour Connemara’s Coastal route taking in the beautiful scenery all the way. Have a look at their website below. Nagles Camping and Caravan Park in Doolin Co. Clare is set between the Cliffs of Moher and the Burren. There is ample amount of space in this campsite for kids to play and ride their bikes and there is pitch and putt and a playground onsite. It boasts stunning views of the Cliffs of Moher which are easily accessible and it is situated close to the Burren if you wish to explore it. The Aran Islands are only a ferry trip away and you can easily drive to nearby towns Ennis, Lahinch and Lisdoonvarna. Doolin is famous for it’s music and will always be busy with plenty of entertainment. There is plenty of history and heritage to be found around Doolin including Tower Houses, Ring Forts and Megalithic Tombs. Find out more below. Overlooking the shores of Strandhill beach this campsite is in a beautiful location under the mountain of Knocknarea. Strandhill beach is famous to surfers from all over the world but if you’re looking for somewhere a little bit quieter then Culleenamore beach is just 2km away. You can walk for miles exploring the sandy beach and dunes. Facilities include a playground adjacent to the campsite, a games room, a library, an outdoor shower facility for surfers and a special needs suite. If you fancy some outdoor activities, there are a number of surf schools and a golf course located near the campsite. The beach promenade is only a five minute walk away where there are restaurants, pubs, newsagents and takeaways and Sligo town is only 8km away. Camac Valley is a beautifully laid out campsite with loads of space near to Clondalkin, Co. Dublin. Facilities include an all weather putting green, children’s playground, free WIFI, an animal farm and fishing lakes. This is a good base for anybody looking to stay near to Dublin to do some exploring. It opens all year round and the Dublin City Hop on Hop off tour bus picks up and drops of guests to the campsite car park. Dublin offers no end of activities to do from a tour of the world famous Guinness Storehouse, a visit to Christ Church Cathedral, St.Stephen’s Green and Croke Park Stadium. If you fancy going on a day trip you could take a trip out to see Newgrange, Hill of Tara or head toward Wicklow to Glendalough or walk along by the sea on the Bray to Greystones cliff walk. Lough Key Caravan Park is situated near us here in Boyle Co. Roscommon. It’s a great location that provides enough activities and facilities that you wouldn’t even need to leave the campsite! They have the Boda Borg that contains 47 rooms with different puzzles and activities that you have to solve in a team!It’s indoors too so it is weather-proof. There is an adventure play kingdom that will keep kids entertained all day, orienteering is available as well as wheel-o which is orienteering for people with limited mobility. All this and more set on a beautiful landscape with historic buildings This 350 hectare estate contains many trails through the woodland and forest for you to explore. If you fancy getting out of the campsite you can go visit Boyle Abbey or Strokestown Park where the Irish National Famine Museum. Sligo is also only a 40min drive away. Check out the link below.